Birthday cakes, anniversary cakes and celebration cakes in Cornubia Brisbane. To order cakes for Cornubia area please contact me. Visit the Design Range page to see more birthday, anniversary and special occasion cakes available for delivery in Cornubia Brisbane. 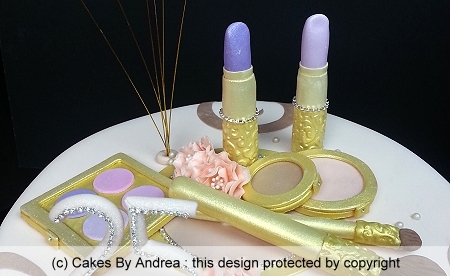 21st birthday cake featuring hand-made sugar paste make up items with diamante highlights and #21 on white fondant with matching fondant covered board.